The beauty of notebooking pages as a part of your homeschool curriculum, whether it be History, Science, Music, Literature or Bible studies, is that it gives all children a great starting point. Here are History Notebooking Pages. 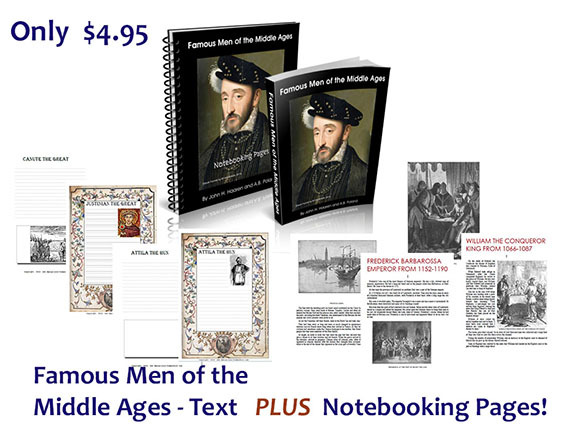 The Famous Men of the Middle Ages E-Book contains the excellent text of "The Famous Men of the Middle Ages" by John H. Haaren and A.B. Poland - which covers more than 30 famous men. As well as the text, it contains notebooking pages to cover all the characters. There are 5 pages for each character - 2 different lined formats to suit younger and older children with and without images. Most pages have a medieval border around it as a part of the Middle Ages Collection. Using the text and simple notebooking pages will help to make your life easier as your children create a wonderful keepsake, a treasured history notebook containing their stories from history.